The major impact that international summits and treaties have had on China’s environmental governance is often overlooked. Environmental protection first emerged as an issue in China in 1972, after the country dispatched a delegation to the UN Conference on the Human Environment in Stockholm. Participation in this event was an important step forward for Chinese diplomacy. More importantly, it marked the point at which China began to create environmental authorities and laws. But the influence of multilateral processes is now waning. The UN-led climate talks suffered major setbacks at the Copenhagen conference in 2009. The 2012 Rio+20 summit proved a pale comparison with its predecessor two decades previously, with results that came nowhere near to touching the three major treaties concluded at the original conference. The world’s hopes for China are contradictory – the country is expected to contribute to economic growth, but also to cut carbon emissions and pollution. This has changed China’s role, from that of a backward pupil to a demanding negotiator. As a result, the simple cause and effect relationship between international processes and Chinese environmental governance has changed. For the layman spectator, it may seem that an increasingly muscular China now shapes the international processes much more than those processes influence Chinese policy. This is only partially true. Those who argue China is taking a tough and conservative stance in environmental negotiations have missed something. Imported ideas such as the precautionary principle, principles of pollution being borderless, of fair distribution of burdens, of common but differentiated responsibilities, all of these foreign norms are constantly under discussion in China, including sometimes in official statements on domestic environmental governance. These trends raise a number of questions. Will China’s worsening environment trigger a change in attitudes to international environmental talks? Will China re-evaluate the value of multilateral environmental processes? 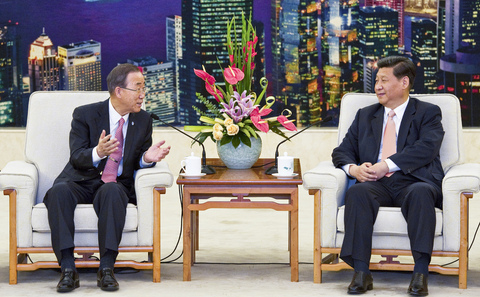 And will China’s new leadership change its policy on environmental diplomacy? China’s environmental challenges have hit a new peak, and the people are no longer able to overlook the failings of environmental protection. No matter how difficult it is to achieve, no matter what the setbacks are, China needs tougher environmental policy. This is something the international community hopes for, and China’s environmental conditions require. And it appears to coincide with the stance of new president Xi Jinping. Speaking ahead of his first presidential tour abroad, which culminated in the fifth summit of BRICS nations (Brazil, Russia, India, China, South Africa) in late March, Xi told journalists from those countries that China would take on more international responsibilities. It remains to be seen if this means gradual change in China’s environmental diplomacy, but it is certain a rethink is urgently needed. Meanwhile at international level, multilateral processes must make clear efforts to promote effective environmental governance in China. “Smart power” must be used when drawing up international environmental laws to make such legislation “cleverer”. If the Minimata Convention on Mercury, reached under the UNEP framework in January this year, teaches us anything it is surely that expecting international law alone to force major policy changes in China is wishful thinking. China is hardly in a position to commit to the most ambitious mercury emissions standard for coal power plants when the corresponding domestic standards are not yet in place. The design of international mechanisms must be based on a full understanding of China’s environment laws, its methods of managing domestic policy and its diplomatic approach and negotiating style. Otherwise a mismatch between international expectations and Chinese realities is likely. One symptom of that disconnect is an overestimation of the Chinese government’s ability to manage different domestic interests and ensure compliance. Although the government attempts to achieve targets through policy, those policies are often distorted during implementation, even to the point that the government fails to comply with its commitments. The rampant wildlife smuggling stemming from China’s inability to control either smugglers or consumption is a typical example. Of course, the degree to which international treaties can play a role is not set in stone but determined by the process in each specific case. Such mechanisms should act as catalysts of change and for them to do so their design must be detailed and subtle. The most important question is how to connect such a tool with China’s own style of environmental management. So far, this level of thinking has been missing both in China and abroad. In international climate talks, promoting transparency in the form of measurable, reportable and verifiable data, for example, builds international trust and helps individual countries to understand their own circumstances. Another example is the Kyoto Protocol, the core of which is quantified emissions targets for industrialised countries. Undeniably, this legal framework gets to the heart of the task of cutting greenhouse-gas emissions. But is this kind of legal obligation the best approach for new climate mechanisms under the platform agreed in Durban in 2011? The new mechanism will be applicable to all – can this arrangement account for different countries’ contexts? Can it be inclusive, and make the maximum possible use of potential for emissions cuts and changes in energy structure? If diplomats negotiate international treaties without a full understanding of China’s legal and policy environment, there will be no boost to the ecological cause in China, and global environmental governance will be stuck with the lowest common denominator. The worldwide environmental crisis is already grave and there is a pressing need for China’s active participation in solving it, but the world’s understanding of this dimension of China is still at beginner’s level. Finally, two extreme points of view – both common in the international political arena – need to be recognised. One is an excessive assertiveness, or even unconstructive China bashing; the other a tendency of pessimists in multilateral institutions to give up on China. These positions ignore the real changes that international climate agreements can bring to a country. Without the Stockholm conference, China’s environmental awareness and administrative framework would have been neglected for many more years. Even the Copenhagen climate talks, regarded as a failure, prompted emission commitments from China, as well as further and sustained attention from the Chinese public and NGOs. These effects will, in the long term, have immeasurable impacts. So how to work with the Chinese giant? As China reconsiders the world, the world also needs urgently to rethink China. This challenge will remain as long as this heavyweight sits at the negotiating table, and only get harder as time goes on. People must learn how to work with China in multilateral climate processes, and the same is true for China’s negotiators. World is on a path towards six degrees celsius of warming by end of the century, with emissions in China and India continuing to rise, according to a report from PriceWaterhouseCoopers (PwC).